U.S. Southern Command’s Military Deputy Commander, U.S. Air Force Lt. Gen. Michael Plehn, visited Colombia March 17 – 19 to meet with Colombian military leaders to discuss strengthening the U.S.-Colombia bilateral security relationship and to deepen understanding of the rapidly changing security situation in the country. Colombia and the United States share a strong security partnership. The enduring military partnership dates back decades. Colombian and U.S. troops served under the United Nations Command during the Korean conflict. 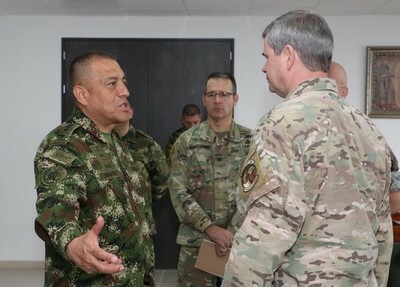 For many decades, U.S. and Colombian troops have worked alongside each other during exercises, humanitarian assistance missions, professional exchanges, and security operations to counter transnational threats.